After the arrival of the Ontario Simcoe and Huron railway in 1853 the formation and use of many building lots in the village of Machell’s Corner changed. In the Township of Whitchurch, Mr. Charles Doan proposed the new name Aurora for the village. In 1863, the village officially became Aurora. In 1867, Charles Doan purchased 4 1/2 acres of land on which he had the Charnal House (Dead House) erected in 1868. Mr. Doan sold these lands together with the Charnal House to the Aurora Cemetery Company following its formation in 1869. In 1879, the company contracted with local builder Henry Harris to construct the “Keepers House” at the entrance to the cemetery. 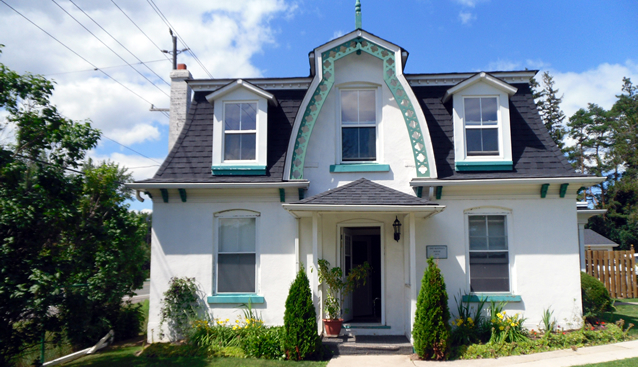 The house being the only example in Aurora of the elaborated Second Empire style of building led to the Town of Aurora designating the property in 1997 as a historic site under the Ontario Heritage Act.1980. Our Charnal House (Dead House) is one of only eight of similar structures in Ontario with unique features such as a tall cupola perched on its roof. We recently restored the Charnal House to maintain the beauty of the building. Behind the Charnal House we have a family mausoleum (Goode). 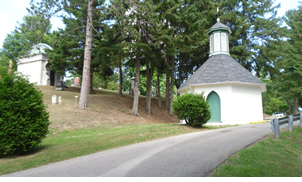 Over the years people have mistaken it for the famous Dunlap Observatory as 60 years ago it was visible from Yonge Street although it is now obscured by trees and the surroundings. It stands in pristine condition with its beautifully crafted copper dome roof. 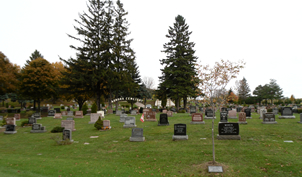 The family recently sold the mausoleum to the cemetery as there are niches left to sell. The big cast-iron sign bearing the name Aurora Cemetery, originally the front gate of the cemetery was moved to the middle of the cemetery a number of years ago.